There have been Irish immigrants in New York City longer than there has BEEN a New York City– Although the most infamous strongholds of Irish immigration within the city have traditionally been the Lower East Side (5 Points) and the area that now forms Central Park (Shantytown), this exhibit will focus on the lives of the Irish living in Greenwich Village in particular, relating their lives to the larger Irish tradition within the city. Although many people associate Irish Americans primarily with the potato famine in the mid-19th century, Irish immigration to America has a much loftier pedigree. There have been Irish men and women in America since long before the country existed as such. The 19th century brough new crises and challenges to the United States and the rest of the world. The Irish played a prominent part across the country, but particularly in New York. They fought in the Civil War, participated in the Draft Riots, and became a major political power within the city. In Greenwich Village they were also a constant over the course of the century, the only ethnic group to maintain a continuous presence in that area during that time. 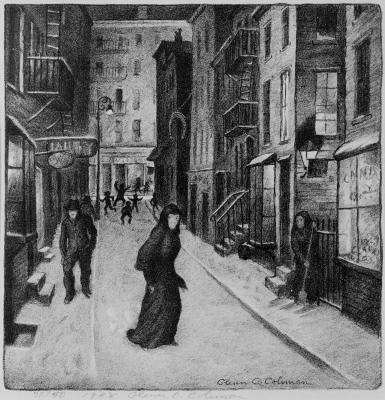 The Irish presence in Greenwich Village wained during the first decades of the Twentieth Century, and by the end of World War II they had moved on to other parts of the city. Although a few stragglers hung on, and there are still spots of Irish culture to be found there today, the vibrant Irish immigrant community has left. As an immigrant group in America, the Irish left behind their homes, land, and most of their possessions. However, the Irish American enclaves centered around their vibrant native culture, which continues to thrive and influence American culture today.